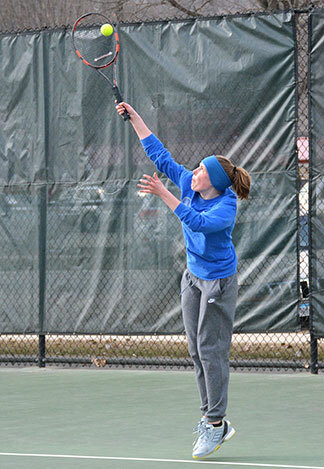 The Decorah girls’ tennis team ventured into Comet country and returned home with its second shutout of the season over Charles City Tuesday evening. Mara Frieden took on last year’s regional third-place netter Jodi Sindlinger in the No. 1 spot to win a couple of 6-1 sets. In the No. 6 slot, Soleil Smith continued her undefeated streak by coming up with a hard-fought victory over Jacie Wink, 7-5 and 6-3. It was a clean sweep in doubles with each duo showing improvement in their aggressive play and reduction in the number of unforced errors, according to Coach Berland. “Playing as a team, each player took a turn in setting up their partner for the put-away shot,” noted Berland. “We were lucky with the weather being as nice as it was for the meet. Next week will be a busy one for the Vikings as they travel to Osage Monday, April 15, for a 4:30 p.m. meet and then are back on the road Tuesday, April 16, to Union for a 4:15 p.m. contest. The week will end with the North Scott Tournament Saturday, April 20, at 9 a.m.